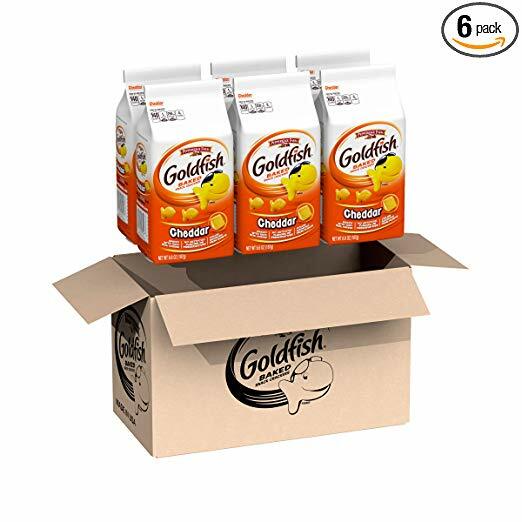 HomeAmazon DealsPepperidge Farm, Goldfish, Crackers, Cheddar, 6.6 oz, Bag, 6-count Only $7.76 SHIPPED! Pepperidge Farm, Goldfish, Crackers, Cheddar, 6.6 oz, Bag, 6-count Only $7.76 SHIPPED! Awesome deal to grab while you can. Score Pepperidge Farm, Goldfish, Crackers, Cheddar, 6.6 oz, Bag, 6-count Only $7.76 SHIPPED! Go & Grow by Similac Milk Based Toddler Drink, (Pack Of 3) 36oz cans + 2 On-The-Go Stickpacks Only $35.08 SHIPPED! Quaker Chewy Granola Bars, 25% Less Sugar Variety Pack, 58 Bars Only $5.71 SHIPPED!